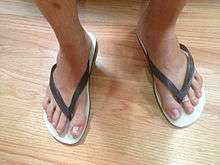 A pair of flip-flops being worn. Flip-flops are a type of open-toed sandal, typically worn as a form of casual wear. 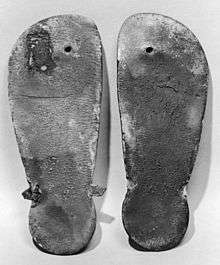 They consist of a flat sole held loosely on the foot by a Y-shaped strap that passes between the first and second toes and around both sides of the foot. The name "flip-flop" originated from the sound made by the slapping of the sole, foot and floor when walking. National Flip-flop day is celebrated on October 3rd. This style of footwear has been worn by the people of many cultures throughout the world, originating as early as the ancient Egyptians in 1,500 B.C. The modern flip-flop descends from the Japanese zōri, which became popular after World War II when soldiers returning to the United States brought them back. They became popular gender-neutral summer footwear starting in the 1960s. Some varieties have since found their way into more formal attire. The term flip-flop has been used in American and British English since the 1970s to describe the thong or no heel strap sandal. It is an onomatopoeia of the sound made by the sandals when walking in them. They could be bought by tracing round the edge of a foot on paper, and then the template would accompany a servant to the market, where he would barter for flip-flops. They are called thongs in Australia, jandals (originally a trademarked name derived from "Japanese sandals") in New Zealand, slops in South Africa and tsinelas in the Philippines (in some Visayan localities as "smagul", from the word smuggled). This footwear has a number of other names around the world. 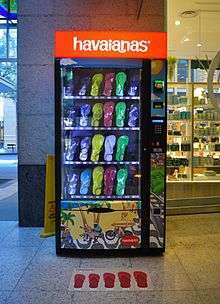 In India and Pakistan, flip-flops are commonly known as hawai chappal. The Japanese wear similarly designed, traditional straw sandals known as zōri. Throughout the world, they are known by a variety of other names, including dép tông or dép xỏ ngón in Vietnam, chinelos in Brazil, japonki in Poland, dacas in Somalia, sayonares (σαγιονάρες) in Greece, Schlapfen in Austria, slippers in Hawaii and the Netherlands, infradito in Italy, djapanki (джапанки) in Bulgaria,"charlie wote" in Ghana and vietnamki in Russia and Ukraine. The modern flip-flop became popular in the United States as soldiers returning from World War II brought Japanese zōri with them. It caught on in the 1950s during the postwar boom and after the end of hostilities of the Korean War. As they became adopted into American popular culture, the sandals were redesigned and changed into the bright colors that dominated 1950s design. They quickly became popular due to their convenience and comfort, and were popular in beach-themed stores and as summer shoes. During the 1960s, flip-flops became firmly associated with the beach lifestyle of California. As such, they were promoted as primarily a casual accessory, typically worn with shorts, bathing suits, or summer dresses. As they became more popular, some people started wearing them for more dressy or formal occasions. A minor controversy erupted in 2005 when some members of Northwestern University's national champion women's lacrosse team visited the White House wearing flip-flops. The team responded to critics by auctioning off their flip-flops on eBay, raising $1,653 for young cancer patient, Jaclyn Murphy of Hopewell Junction, New York, who was befriended by the team. There is still a debate over whether this signaled a fundamental change in American culture — many youth feel that flip-flops are more dressy and can be worn in a variety of social contexts, while older generations feel that wearing them at formal occasions signifies laziness and comfort over style. In 2011, while vacationing in his native Hawaii, Barack Obama became the first President of the United States to be photographed wearing a pair of flip-flops. The Dalai Lama of Tibet is also a frequent wearer of flip-flops and has met with several U.S. presidents, including George W. Bush and Barack Obama, while wearing the sandals. Flip-flops have a very simple design, consisting of a sole with a strap passing between the big and second toes. The modern flip-flop has a very simple design, consisting of a thin rubber sole with two straps running in a Y shape from the sides of the foot to the gap between the big toe and the one beside it. They typically do not have a strap around the heel, although heeled varieties are available, as well as flip-flops designed for sports, which come with added support common to athletic shoes, with the thong between the toes. Most modern flip-flops are inexpensive, costing as little as $5, or less in some parts of the world. They are made from a wide variety of materials, as were the ancient thong sandals. The modern sandals are made of more modern materials, such as rubber, foam, plastic, leather, suede, and even fabric. Thongs made of polyurethane have caused some environmental concerns — since polyurethane is a number 7 resin, they can't be easily discarded or they will be in landfills for a very long time. Due to these concerns, some companies have begun to sell flip-flops made from recycled rubber, such as that from used bicycle tires, or even hemp. In response to environmental concerns, some companies offer a recycling program for used flip flops. Because of the strap between the toes, flip-flops are typically not worn with socks. Though, in colder weather, some people may wear flip-flops with toe socks. The Japanese commonly wear tabi with their zōri sandals, which is a traditional sock with a single slot for the thong. While flip-flops do provide the wearer with some mild protection from hazards on the ground, such as hot sand at the beach, glass, thumb tacks or even fungi and wart-causing viruses in locker rooms or community pools, their simple design is responsible for a host of other injuries of the foot and lower leg. In the United Kingdom in 2002, 55,100 individuals went to hospital with flip-flop related injuries. By 2010, there were 200,000 flip-flop related injuries costing the National Health Service in Britain £40 million. Walking for long periods in flip-flops can be very tough on the feet, resulting in pain in the ankles, legs, and feet . A 2009 study at Auburn University found that flip-flop wearers took shorter steps and their heels hit the ground with less vertical force than those wearing athletic shoes. Individuals with flat feet or other foot issues are advised to wear a shoe with better support. The lack of support provided by thong sandals is a major cause of injuries . Since they have a spongy sole, the foot rolls further inward than normal when it hits the ground — an action called over-pronation, which is responsible for many foot problems . Overpronation may also lead to flat feet . Flip-flops can cause a person to overuse the tendons in their feet, resulting in tendonitis. The lack of an ankle strap that holds the foot in place is also a common reason for injury, as this causes wearers to scrunch their toes in an effort to keep the flip-flop in place, which can result in tendonitis. Ankle sprains or broken bones are also common injuries, due to stepping off a curb or tumbling — the ankle bends, but the flip-flop neither holds on to nor supports it. The straps of the flip-flop may cause frictional issues, such as rubbing, during walking. The open-toed nature of the thongs may result in cuts, scrapes, bruises, or stubbed toes. Despite all of these issues, flip-flops do not have to be avoided completely. Many podiatrists recommend avoiding the inexpensive, drug store varieties and spending more on sandals with thick-cushioned soles, as well as ones that have a strap that's not canvas and that comes back almost to the ankle. ↑ "Morris Yock trademarks the jandal". New Zealand History. 4 October 1957. Retrieved 10 June 2016. ↑ "Flip-Flop Brigade". terracycle.com. Retrieved May 31, 2015. 1 2 Wheldon, Julie (August 3, 2006). "Flip flops can damage your health". Daily Mail. Retrieved July 19, 2012. ↑ Borland, Sophie (July 29, 2010). "Flip-Flops 'injure 200,000 a year' costing the NHS an astonishing £40m". Daily Mail. Retrieved July 19, 2012. ↑ Shroyer, Justin F.; Robinson, Leah E.; Weimar, Wendi (August 27, 2009). Influence of thong flip‐flops on running kinematics in preschoolers (PDF). Annual Meeting of the American Society of Biomechanics. Penn State University. ↑ Watson, Nicole (July 18, 2012). "Study: Comfortable flip-flops causing painful health risks". ABC Action News. Retrieved July 19, 2012.